Hundreds of people of all ages had the opportunity to become acquainted with marine sciences and current research methods last Friday on the 27th of September 2013 during the MAREXPRES (MARine EXPloring RESearchers) event. MIO-ECSDE & MEdIES were there! 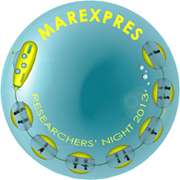 At the old building of the University of Athens in Plaka, MAREXPRES was organised within the framework of the European Researchers’ Night 2013. The event was organized by the laboratory of Natural Geography, Faculty of Geology and Geo-environment, University of Athens and the Association of Greek Oceanographers in cooperation with the Dpts. of Environmental Education (EE) of Primary and Secondary Education of Athens. MIO-ECSDE / MEdIES carried out a series of educational activities on the topics of climate change and sea water rise; marine litter and key threats of the coastal and marine environment of the Mediterranean, highlighting also important values, such as respect for nature, multiculturalism, solidarity, democracy and sustainable development. The interactive activities targeted primary-level students, aged from 6 to 10 and attracted the attention of some 60-70 children. In parallel, members of the MIO-ECSDE team, had the opportunity to showcase the FP7 MARLISCO project, where MIO-ECSDE is a key partner, and also hand out information material with useful tips on how to minimize litter entering the marine and coastal environment (find more info at the ‘Keep the Mediterranean Litter free’ pamphlet). Researchers’ Night takes place every year across Europe on the fourth Friday of September. Events are organized in most EU countries, as well as in Bosnia and Herzegovina, the Faroe Islands, the former Yugoslav Republic of Macedonia, Iceland, Israel, Montenegro, Serbia and Turkey and this year over 300 cities participated in this mega event. The event aims to highlight the important role research plays in our daily lives and science as a career. Encouraging more young men and woman to choose a career in research and science is crucial for Europe’s future growth, which is increasingly dependent on innovation in products and services. Researchers’ Night is financially supported by the EU’s Marie Curie Actions.